We know authoritativeness is essential to our viewers, so we’ve been investing in new product features to prominently surface authoritative sources across the platform. Our Top News shelf prominently highlights videos from authoritative news sources in search results. And when a breaking news event happens, we want users to know about it. That’s why our Breaking News shelf highlights videos from authoritative news organizations about that event directly on the YouTube homepage. Both features are currently launched in more than 30 countries, including India in both English and Hindi. When users come to YouTube, we believe they should be able to make their own decisions about the information they consume. We want to provide context alongside content on our platform to help users make more informed judgments, which we've done by introducing a wide range of information panels on certain events, topics, and publishers alongside search results and videos. We recently expanded our information panels to bring fact checks from eligible publishers to YouTube in India in English and Hindi. This specific information panel aims to provide context on fresh topics that are prone to misinformation. The fact checks we surface rely on the open source Schema.org ClaimReview markup process. By following this process, any eligible publisher can contribute fact check articles that could show in search results on Google Search, Google News, and now, YouTube. And today, we are taking another small step in our efforts by rolling out additional information panels in English and Hindi. If a channel is owned by a news publisher that is funded by a government, an information panel will surface that indicates that the publisher is “funded in whole or in part" or a “public broadcast service”, with a link to the publisher's Wikipedia page. 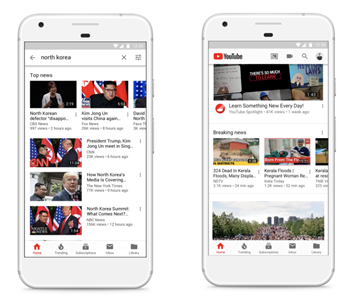 Our goal is to equip users with additional information to help them better understand the sources of news content that they choose to watch on YouTube. This information panel will be displayed on the watch page of all the videos on its channel. Finally, we know quality journalism requires sustainable revenue streams, so we believe we can and must do more to support quality journalism and the news industry through innovation in technology. At YouTube we have committed $25M to the news industry, as a part of a broader $300M investment by the Google News Initiative. In December, we announced funding to 87 news projects from 23 countries around the world to build stronger video capabilities and innovate with new video formats. And 10 of these projects came from India. We are also investing in expanded support from YouTube specialists to support news partners grow their presence on YouTube, from providing training to helping with sophisticated technical integrations. We believe these positive steps will improve your experience of consuming news on YouTube and we look forward to continuing our close partnership with India’s news industry, as we continue our efforts in this space.